The African Action Congress (AAC), has alleged that Akpo Bomba Yeeh, its governorship running mate in Rivers State who resigned on Monday, took the decision after he was kidnapped by agents of Governor Nyesom Wike. Alexreports recalls that Yeeh, had announced his resignation from the party while blaming it on minister of transportation, Mr. Rotimi Ameachi, whom he alleged had hijacked the structures of the party. Yeeh alleged that Rotimi Amaechi, minister of transportation, forced him to sign an undated letter that he would step down after inauguration and that the minister confirmed to him and Awara that he had assembled a team of security personnel who would facilitate rigging of the election. "Please note also that by this notice, I cease to be the Deputy Governorship Candidate of our Party, the AAC, for the 2019 Governorship Election in Rivers State. My decisions were informed by the complete hijack of the structure and administration of our Party by a faction of the APC in Rivers State led by the Minister of Transportation, Chibuike Rotimi Amaechi, for his personal political ambition, Yeeh wrote. He added that he "was forced to sign an un-dated letter of resignation as the Deputy Governor of Rivers State to pave way for Rotimi Amaechi to nominate another person as Deputy Governor". But countering his claims in a statement obtained by AlexReports on Tuesday, Felix Enimini, Publicity Secretary of the party who signed for the chairma, Progress Ogbokuma, alleged that Wike's agent abducted the candidate, forced him under duress to resigned a prepared resignation letter after he was induced with N200million, a SUV jeep, accommodation, and promise to include him in his cabinet if re-elected into power. "Its not a surprise to us the African Action Congress (AAC) that our deputy governorship candidate Chief Akpo Bomba Yeeh claimed he has resigned his candidacy, and defected immediately to the Peoples Democratic Party(PDP). "The resignation/defection of Akpo Bomba Yeeh indicates high level of desperation of governor Wike and the Peoples Democratic Party cohorts to retain power after the good people of Rivers State have rejected them by voting over whelmingly for the African Action Congress (AAC) on the 9th of March, 2019. "We wish to inform the general public that our deputy governorship candidate Akpo Bomba Yeeh was kidnapped by Wike agents at about 2:30pm on Sunday and was taken to government house in Port Harcourt where he was forced to resign/defect to the PDP and the sum of two hundred million naira, a SUV jeep and accommodation was given to him. Governor Wike also promise to include him in his cabinet if re-elected into power. "The press statement by Akpo Bomba Yeeh was written by Special Advicer to Wike on media and publicity and the allegation made against His Excellency, Rt Hon Rotimi Amaechi and the African Action Congress (AAC) was cooked up by Wike and his cohorts. "The resignation/defection of Akpo Bomba Yeeh was under duress and inducement by the Peoples Democratic Party (PDP). "Let me use this opportunity to debunk the purported rumour by the Peoples Democratic Party that the APC is holding Engr Biokpomabo Awara and his Chairman Progress Ogbokuma hostage so that they won't defect to the PDP. "Engr Biokpomabo Awara and his Chairman are men of intergrity. 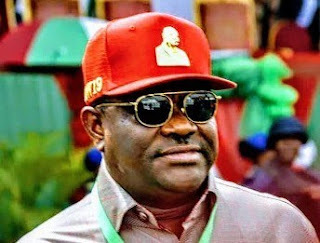 No amount of money can compel and entice them to dance to Wike's tone of "everyman has a price tag" thereby defecting to the PDP to enable him achieve his desperate ambition. "We the African Action Congress(AAC) strongly believe that our victory is sure with the help of God and the support of the good people of Rivers State".